in the average Australian home. When budgeting for a heating or hot water system there are three factors that should be taken into account. The first factor is the cost of purchase, then the cost of installation and lastly the running costs. Over the lifetime of an appliance the running costs can amount to a small fortune proving to be the largest of the three costs. 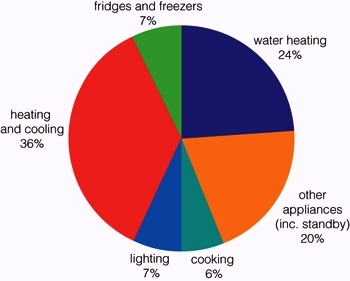 As the chart below clearly shows the two greatest users are heating/ cooling and hot water heating. This chart is from the Energy website of the Department for Transport, Energy and Infrastructure. The running costs in turn are affected by the impact that the unit will have on our environment. What is the Carbon Tax and Governments Trading Scheme? 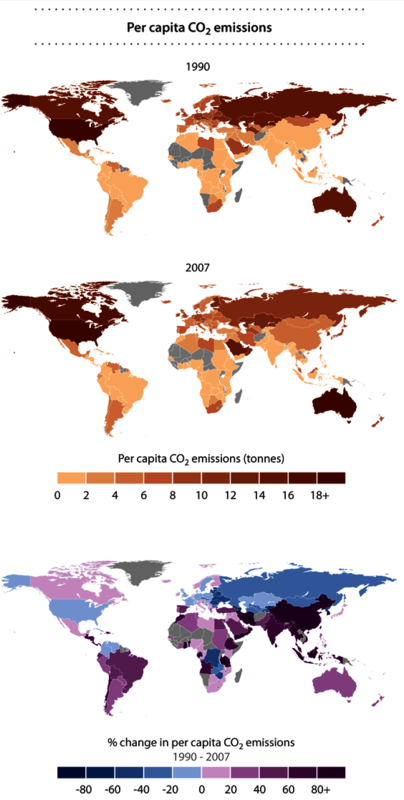 Between 1995 and 2005 carbon emissions in Australia grew by 43% against the UK's 4%. In 2000 we ranked number 9 on a list of 185 countries using then 25.5 tonnes of CO2 per capita In 2007 we were number 12 on the list using 17.2 tonnes per person per annum. That still keeps us in the higher end of the list but it is encouraging to know that we are headed in the right direction. With growing pressure from national and international community's the way we use energy is changing and will continue to change. In 2001 the Renewable Energy Target (RET) was created by government to help establish and develop renewable energy industries and markets. Because Carbon Dioxide (CO2) is the largest greenhouse gas after water vapour, a scheme is being developed to discourage the production of CO2 whilst other schemes are being developed to encourage the use of renewable energies. This scheme to discourage the use of fossil fuels is the carbon tax. The scheme to encourage the use of renewable fuels is the emissions trading. 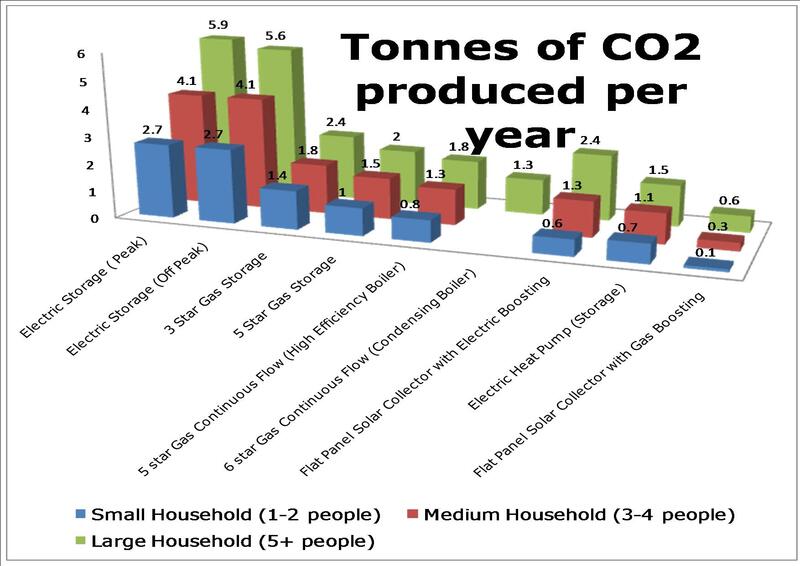 Carbon emissions is how much carbon, measured as a weight in tons or kg's, a unit of energy produces. This weight will be linked to the price of energy in the form of an energy tax. The following graphs give an indication of what will happen to energy bills once the Federal Government's proposed carbon tax scheme is factored in, or in other words when people start paying for their energy in part per kg. 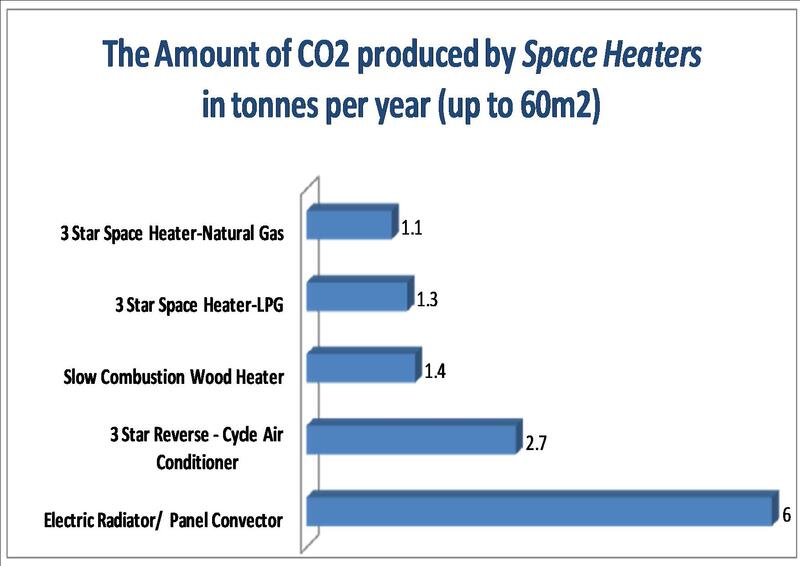 The following 2 tables show how central heating compares with space heating. In lieu of these coming changes the government at different levels has taken steps to encourage people to make the change before the taxes are ushered in. Electrical Storage tanks are no longer allowed to be installed in many suburbs and only 5 star rated gas continuous flow hot water boilers may be installed residentially. Under the Australian Government's Renewable Energy Target (RET) new solar and heat pump hot water heaters may be eligible for Renewable Energy Certificates (RECs). These RECs are a commodity and can be traded by the consumer with the manufacturer, the installer or an independent REC's trader depending on who is offering the highest price. The value of a REC is not fixed but varies with supply and demand so you could shop around to get a better price. The amount of REC's awarded to a model depends on how efficient it is, what the capacity is and which REC's zone the installation is going to be installed. 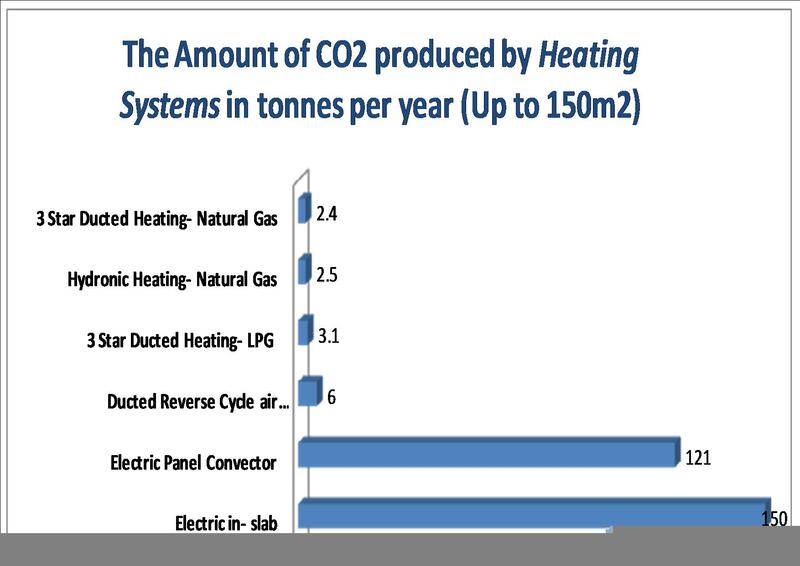 Comparing REC's is therefore a way of comparing efficiencies of different models of heat pumps or solar systems. 1 REC equals 1MWh of generation from a renewable source. The amount of REC's awarded for a certain brand is multiplied by the value of the REC's at the time of purchase and the total amount becomes your discount off the sale price (e.g. 30 RECs X $25 =$ 750). Most manufacturers have their own REC's calculator on their website to help people find out how many RECs the unit is eligible for. Simply select a hot water system from Reece's site here, visit the manufactures website and select their REC's calculator or phone them up and ask. Alternatively one could simply visit the Office of Renewable Energy and use their REC's calculator. When applying for REC's the brand and model of the solar or heat pump hot water unit is needed as well as the climate zone where the unit is to be installed. Adelaide is in Zone 3, but most REC's calculators ask for your post code (see below for a Zone map). Of course I am happy to walk you through the process. Whatever your choice, I can provide further advice and install it. The Federal Government assists households to save money on power bills and reduce their carbon emissions under "The household Renewable Energy Bonus Scheme". Eligible households can claim a rebate of $1,000 for a solar hot water system or $600 for a heat pump hot water system. This rebate applies for systems ordered and purchased from 20 February 2010. However these rebates are decreasing and these figures are only accurate at the time of publication. Rebates are only available to people who have not previously received assistance to install ceiling insulation through the Home Insulation Program or the Homeowner Insulation Program at this address. The system must replace an existing electric storage hot water system. An owner-occupier, landlord or tenant can apply for the rebate as long as the dwelling where the hot water system is installed is a principal place of residence. The system must be installed and certified by a suitably qualified person (for example an electrician and/or plumber). Commonwealth Seniors Health Card, State Seniors Card, Medicare card, DVA White and Orange cards are not eligible. Please note this is a South Australian based business. In 1999 following research and consultation into greenhouse gas emissions of buildings the Australian Government and the building industry agreed to work towards making buildings more energy efficient by encouraging voluntary best practices in design, construction and operation and to eliminate worst energy performance practices by incorporating a minimum performance standard into the Building Code of Australia. In 2006 South Australian homes were required to meet a 5 rating. Prior to the 5 star rating homes generally achieved a 2.2 Star rating. Since September 2010 homes are required to meet a 6 star rating in South Australia. 6 Star ratings are applicable to new buildings and alterations done to existing buildings. Initiative and foresight is encouraged. In Germany buildings are required to generate 20% of their energy requirement. To achieve a 6 Star rating consideration must be given to design and orientation, insulation, ventilation, glazing and an assessment of the efficiency of appliances used for hot water, heating and cooling. 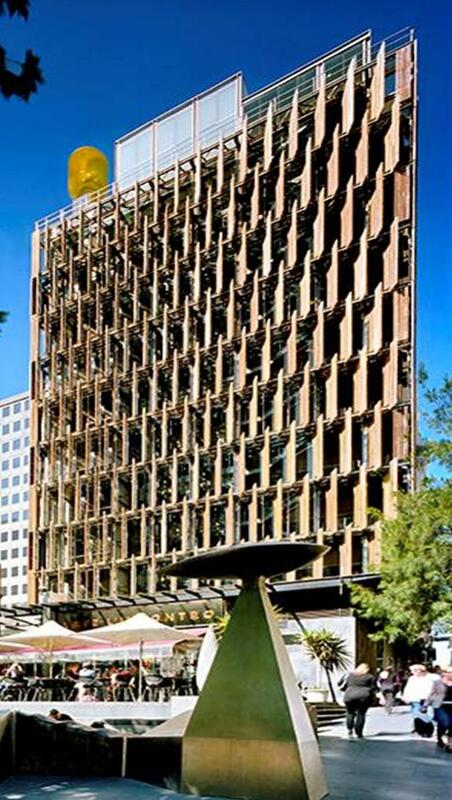 In 2006 Australia's first 6 Star Green Star building was completed inMelbourne known as the Council House 2. The objective of the Council House 2 (CH2) is to raise awareness of sustainable design concepts and to provide a healthy and comfortable working environment for its staff. A study has been made looking at the benefits of a healthy and comfortable work environment and the impact it has on productivity and well being of the staff. It is reported that absenteeism has dropped from 3.6 days to 1.5 days per year. Apparently this is a saving of $2.4 million annually which could pay of the $11 million spent on green technology within 5 years! And that is not even taking into account the saving on energy. I have included the links to Melbourne's CH2 website and to an article written in the Green Source Magazine. Due to sustainable design heating and cooling switch on only for a few hours in the morning and/or afternoon to boost the thermal comfort. Attention has been paid to thermal mass, air ventilation and shading. 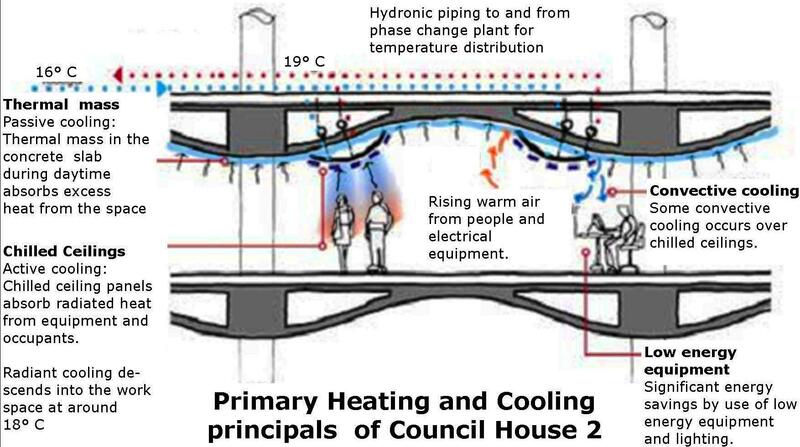 Heating and cooling systems are fed by a hydronic installation. The hydronic heating system is designed to act as a boost providing a warm air blanket only at the windows. 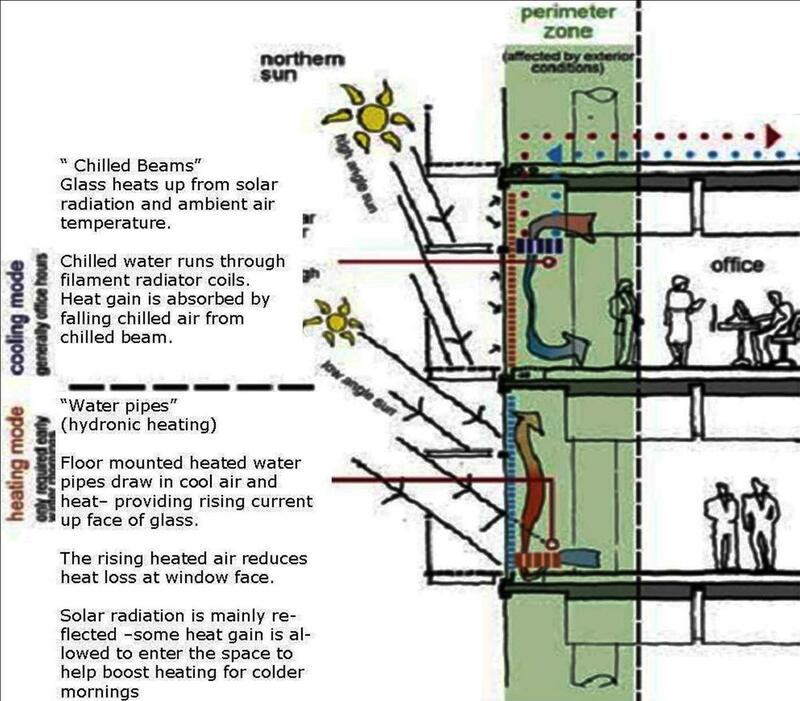 The primary heating is done by recycling the heat generated by passive sunlight, people within the building and the computers and other electrical devices. This heat is trapped in the undulating ceiling and transported away through the ventilation. The heat is finally extracted from the stale air and then re added to the fresh air. In this way the heat is cleverly recycled. 40% of the energy used for heating comes from recycling extracted waste heat. This is the same concept a condensing boiler works on. A combination of 26m2 of photovoltaic's (PV solar panels) and a gas fired co-generation plant will provide the bulk of the electricity needs. The solar panels actually track the sun on rotational axes. 60% of the office's hot water is provided for by about 26m2 of solar panels boosted by natural gas. Through solar and recycling technology boosted with natural gas, carbon emissions are expected to be 64% less than 5 star buildings. Natural gas consumption will be reduced by 87%. The CH2 building in Melbourne led the way being the most energy efficient in Australia and possible the world at the time it was built. Since then there has been an explosion in green buildings with 250 new buildings aiming at achieving green stars. ©Adelaide Hydronic Heating. All rights reserved. Design by NodeThirtyThree.